*The Pace Tool is only available if the Real View is disabled, or any version prior to version 7. See the Visuals Editor for information on how to change pace if the Real View window is enabled. The Pace tool is used during animation to show a performer moving in double time, half time, or regular time (one step per count). When a performer is marking time, the mark time pace is displayed by flashing the performer twice per beat for double time, once every other count for half time, once per beat for regular time, or no flashing at all for performers holding their position. Move the Red anchor to the count of drill where the change of pace will stop. Move the Yellow anchor to the beginning of the transition where the change in pace will start (usually the previous set). 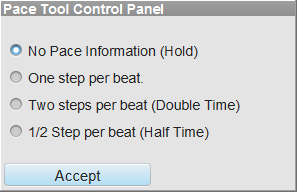 Select the existing performers whose pace will be changing using a Selection tool such as the Pointer tool. Click on the Pace tool and the Pace Tool Control Panel will be displayed. Enter the pace change information and click Accept. You can preview the change by clicking on the Play (animation) button prior to committing the change.